Dr. 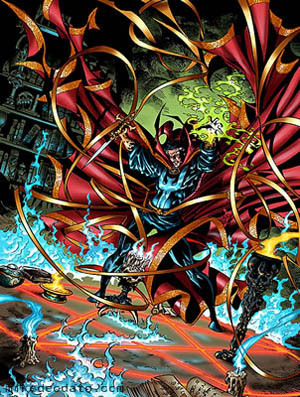 Strange was literally one of the strangest characters created in the Marvel comics universe. 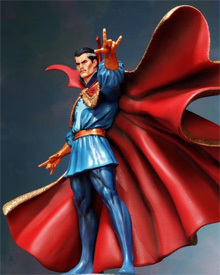 He was created in 1963 in the comic book called Strange Tales. He is a normal person that gained magical abilities through magical amulets, talismans, and other artifacts. He was later given the title of Sorcerer Supreme All of his abilities come through his magical practices, rituals, and teachings. There have been times when Dr. Strange, has needed more power, and he has summoned the powers of demonic entities from another dimension to either do his bidding, or super charge himself with even more magical power. In the Marvel Universe Dr. Strange is referred to as the most powerful magician in the cosmos. Not just Earth. He has the ability to do anything he desires. He can use telepathy, time travel, shoot energy blasts from his hands, and even create protective barriers around the Earth. He has even been seen resurrecting the dead, and even materializing food, water, and other supplies. His powers do not seem to be limited in anyway, only magnified with his occult rituals and talismans. When performing his magical abilities Strange often calls on the appropriate demon or entity created within the Marvel Universe such as the Vishanti, or the Elder Gods. There are many demons that exist in the Marvel universe and Strange seemingly uses these entities to aid him in his quest for power, and all the while being the savior for humanity. Strange's power is so great, he has the knowledge of sealing a black hole. He can cross into both inner and outer dimensional realms. He can even create a flying force field that allows him the ability to fly through space and time. Dr. Strange has been schooled by Kaluu who in the Marvel universe is a black magic sorcerer who later becomes a business man who makes a massive amount of wealth. He teaches Dr. Strange how to use black magic, but it becomes addicting to Dr. Strange and Kaluu has to later purge Dr. Strange of this magic before it takes over his very soul. The Cloak of Levitation - This cloak has very strange abilities not just the ability of flight. This cloak is very durable and is even a form of protection for Dr. Strange. The Cloak has been seen grabbing on to the sides of buildings, or even used to climb a building. It seems to have a mind of its own, and it comes when Dr. Strange calls for it, and even responds to other commands. It does however require magical abilities in order to operate, but Dr. Strange handles this very well, this is why the cloak supplements his power. The cloak also has the ability to change the way it looks. In some comics it has taken the form of a trench coat or jacket, only to transform back when ready to be used. 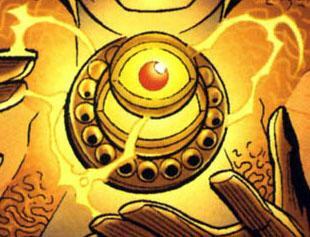 The Eye of Agamotto - This is a very strange amulet that Dr. Strange wears almost all of the time. Its origins are unknown, and its creator in the Marvel Universe Steve Ditko, said that he got inspiration for this mystical amulet from the "All Seeing Eye". If this wasn't strange enough, even in the comics its origins are unknown. It is said that Agamotto (a powerful mystical being in the Marvel Universe) found it while searching the stars in space were it drifted for an unknown period of time. Dr. Strange consults with this artifact, and the eye sometimes shows him truth, and direction in a very strange and unexpected way. It is believed that if this were in the wrong hands it could be disastrous. The Book of Vishanti - This is a strange mystical book and the author is unknown. It could have been written by the Vishanti themselves who are 3 powerful magical beings in the Marvel universe known as Agamotto, Oshtur, and Hoggoth. This book is said to be a collective of white magic spells that could be used for evil. This book has an opposite called the Darkhold, which is not used in Strange's arsenal even though his character seems to be against all religions of the world. The Darkhold is a collective of all black magic. 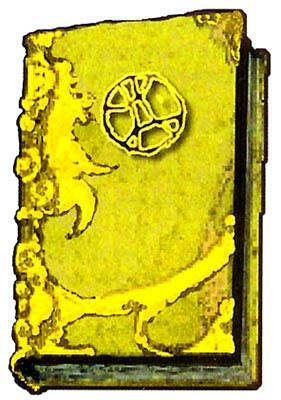 The first one to posses this Book of Vishanti, was an Atlantean sorcerer by the name of Varnae. I think that it is very strange that a lot of things that have to do with Dr. Strange, also have to do with mysticism in the real world. The Book of Vishanti, and the Darkhold book, are both indestructible. In closing I would just like to say that the purpose of this post was to show just how evil and demonic some of the Marvel universe really is. In the 1960s through the 1970s it was very occult in nature speaking of alternate dimensions and universes, and even touching on quantum physics. These comics were very ahead of their time and the inspiration for some of these fictional artifacts and people could possibly have some truth to them. Dr. Strange even does the satanic salute with every spell that is cast from his fingertips. Could this all tie into our real reality in someway? Did these writers know something that we don't? Lets not forget that Marvel comics is still a force to be reckoned with to this day and their power and influence on society has not changed a bit, in fact, it has become stronger. Who knows what modern mystics, sorcerers, and witches, could really learn from the Marvel Universe. I wonder if any Marvel comics employees are initiated into secret mystery schools like the Order of the Golden Dawn, the OTO, The Brotherhood of the Snake, or the Illuminati? Of course this is all speculation, but how could these guys be so spot on with occult knowledge? You be the judge please leave comments below about what you think.